In 2013, Residents and visitors to New York City during the Christmas Holidays were greeted by a new sign in Times Square displayed by the American Atheists. 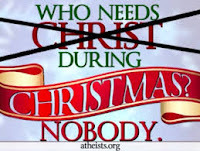 A digital billboard proclaimed, “Who needs Christ during Christmas?” A hand crosses out the word “Christ” and the word “Nobody” appears. Despite the atheists’ proclamation that Christmas is irrelevant and obsolete, over two billion Christians around the world continue to celebrate the greatest event in human history, the birth of Jesus of Nazareth. While everyone enjoys the tapestry that surrounds the holidays, Christians preserve and cherish the celebration of the birth of the Holy Child of Bethlehem who reaffirms the presence of God in their lives. How ironic that atheists say Christ isn’t needed at Christmas when it was the Prophet who taught people to love their neighbors ___ even those who deny that God exists. May the Prince of Peace continue to bless those who believe in Christmas and those who do not. Many years ago, a magazine ranked Bethlehem, Pennsylvania last among 300 places to live in the United States. If Bethlehem, Pennsylvania ranked 300th, the sleepy little town we sing about at Christmas would have ranked even lower, for it had little to recommend it as the perfect birthplace of the Savior. But God seems to have different standers for perfection than we have, and there is something about the story of Christmas that goes beyond perfection and logic. A virgin bears God’s son in a stable? It’s beyond our comprehension. If God wanted to be intimately part of man, he moved correctly, for the experience of birth and family-hood is our most intimate experience. It's a story of great innocence of God the baby. God in the person of man. Perhaps your Christmas won't be perfect this year. Maybe . . . it will be far better than that. maybe you will see right to the heart of this sacred event . . . to the God who seeks not perfection . . . but love.